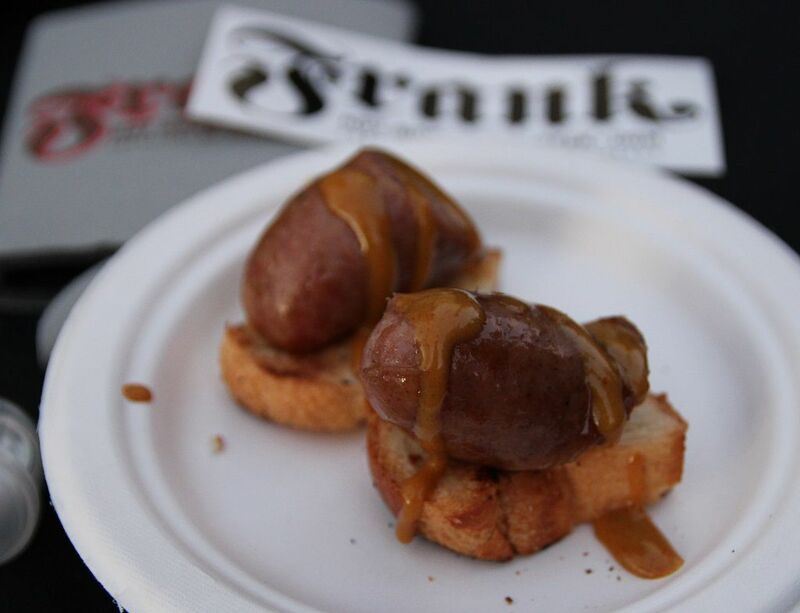 The first Sausage Kings of Austin contest was held by 365 things Austin Wednesday January 27th in Austin at Austin Beerworks The event was a competition between eight of Austin’s best purveyors of sausage, including four popular barbecue joints. In addition to samples from nine entrants (some of who offered more than one type of sausage) the $24 ticket price included three beers from the brewery and a keepsake glass. In addition to free stickers and koozies from some of the vendors Evan LeRoy of Freedmen’s handed out business cards with a $10 off discount included. The ticket price was reasonable and the event intriguing enough I decided to make the mid-week drive from Houston to Austin to check it out. After enduring numerous sophomoric jokes from my coworkers regarding a sausage fest, I said goodbye at mid-day while they toiled in their cubicles. With the event starting at 6pm it meant I had to drive through Austin rush hour traffic. Insert your own complaint about Austin traffic here. When I arrived I saw the large garage doors of the brewery open and people milling about. It was a mostly outdoor event and the recent cold front made for a chilly but not unbearable evening. After my first beer sample and a few sausage samples the band kicked in and it seemed to warm up although I am sure it was me. Ok maybe it was the beer, too. The sausage was the star and it was bright and tasty. Vendor booths ran from simple butcher paper and sausage samples to very impressive displays with much more than just sausage to eat. 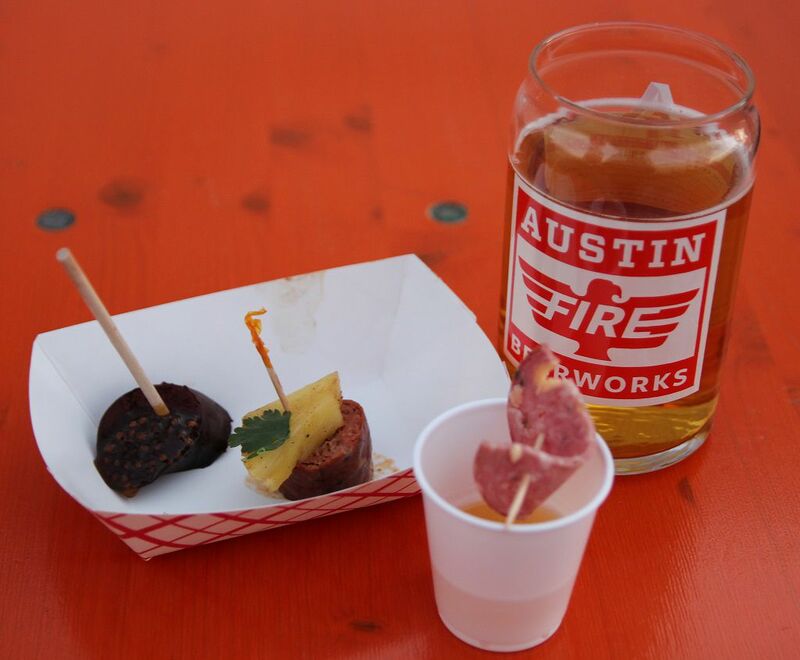 Several vendors included Austin Beerworks beer as an ingredient and many created a sausage variety just for the event. I enjoyed every sample, and most of them multiple times. 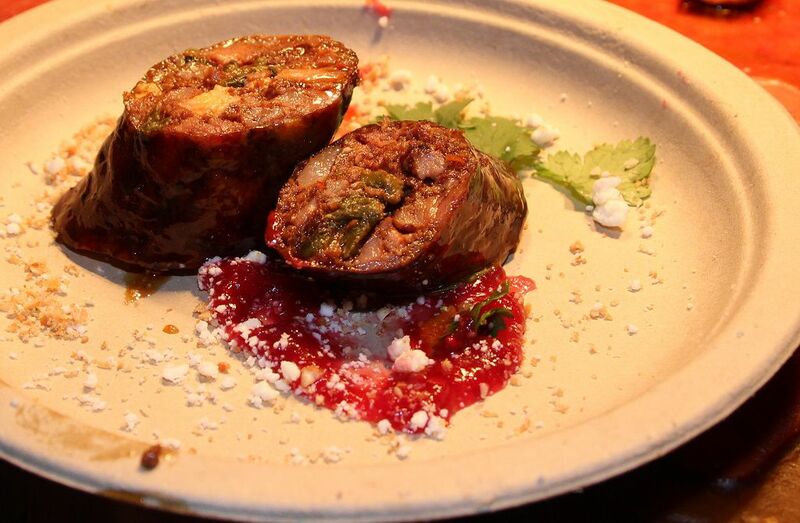 The most memorable were Freedmen’s buffalo chicken sausage and their pepperoni pizza sausage, Smokey Denmark’s Mole sausage, and La Barbecue’s chipotle sausage. 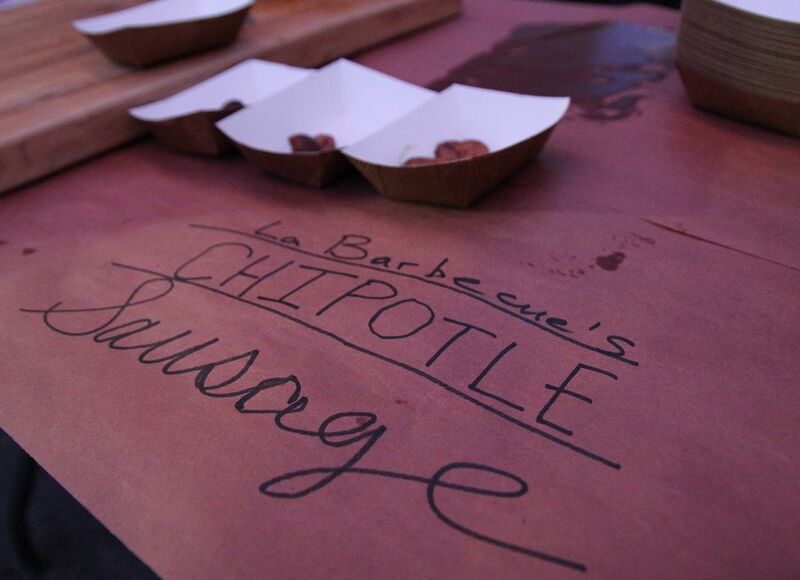 You can catch La Barbecue’s sausage on the menu these days and you should check it out. 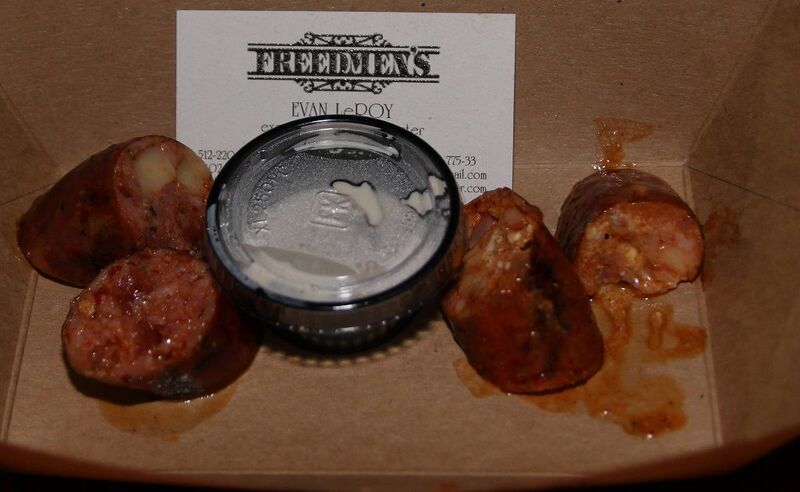 It is worth repeating though that I enjoyed all of the samples and the art of sausage making was well represented. 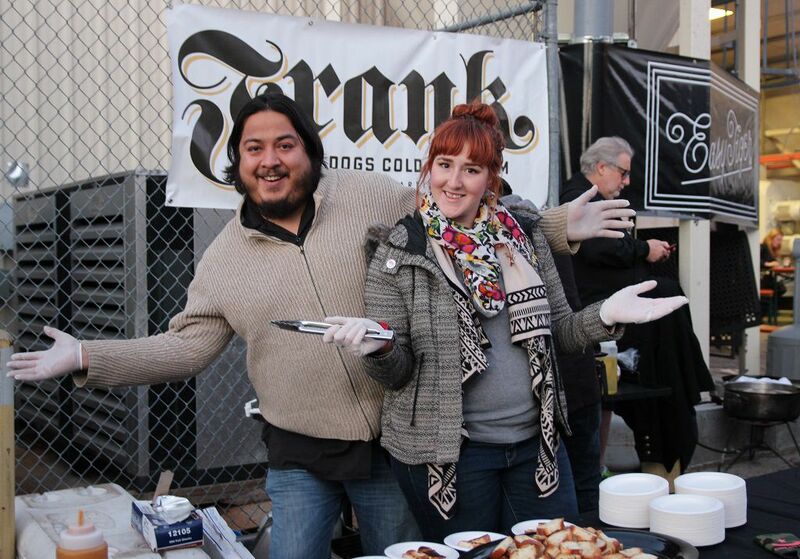 Congratulations to La Barbecue who were crowned the winners! Of the vendor booths Easy Tiger had the most impressive, with kielbasa served up alongside beef jerky and chex mix in a very professional display. 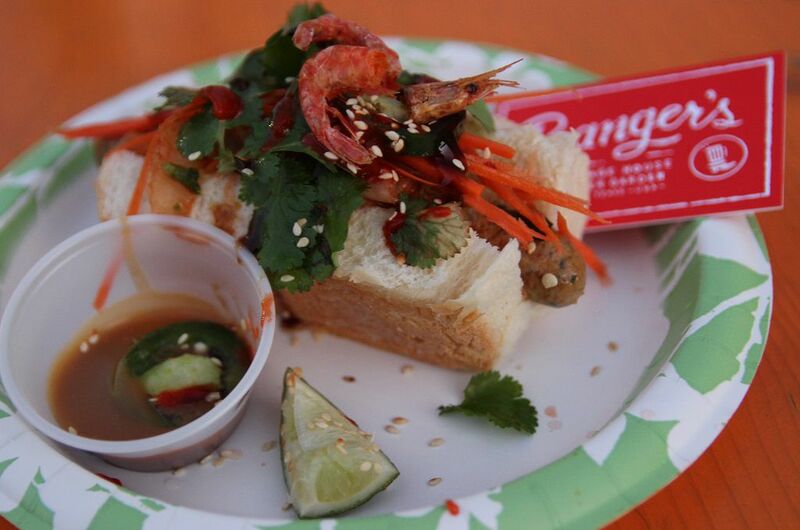 Banger’s had the most impressive food item, a very flavorful Dak bulgogi sausage on a roll and adorned intricately. In barbecue it is sausage that offers the most freedom to express yourself but often it is either commercially made or limited to “regular or jalapeno cheese.” Lately in our barbecue runs Scott, Andrew, and myself have been exploring the different styles of sausage available across southeast and central Texas and have been impressed with the quality we’ve encountered. At this event though most vendors stretched their wings and I would love to see some of these pop up more often on the menu. 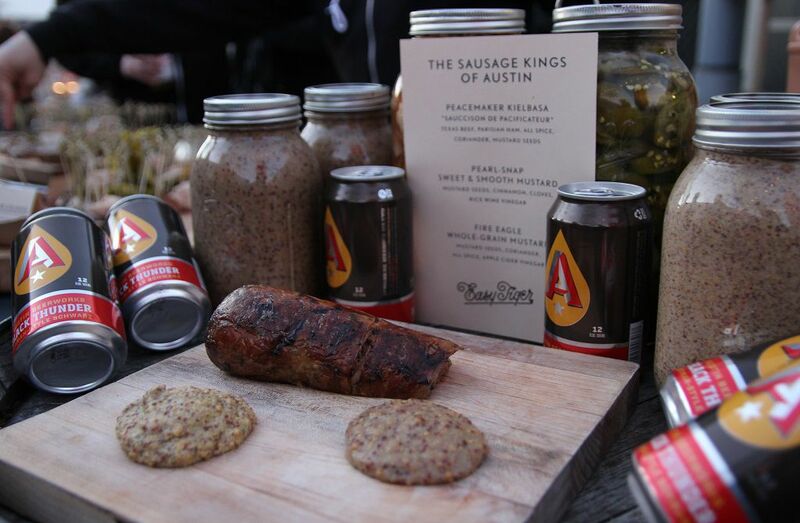 Tags: Sausage Kings of Austin.